The mechanism of high-temperature superconductivity in Fe-based superconductors is still unclear. The upper critical field and its anisotropy are basic parameters which are crucial for understanding both the mechanism of superconductivity and its potential applications. In a recent Journal of Physics: Condensed Matter paper, Dr Zhaosheng Wang et al. studied the temperature dependence of the upper critical field (Hc2) and its anisotropy in (Li1-xFex)OHFe1-ySe (FeSe11111) single crystals by means of magnetotransport measurements. Read on to find out more from the authors themselves. Temperature dependence of Hc2 of FeSe11111 extracted from the magnetotransport measurements. Taken from J. Phys. Cond. Mat. 28 025701 © IOP Publishing 2016. All rights reserved. Iron selenide superconductors have attracted a lot of attention since the discovery of high-temperature superconductivity in AyFe2-xSe2 and single-layer FeSe films grown on a SrTiO3 substrate. However, chemical phase separation and interface effects hamper well-targeted experimental studies clarifying the origin of high-temperature superconductivity. The new Fe-based superconductor FeSe11111 is a single-phase bulk superconductor with a relatively high Tc, free from complications of phase separation and interface effects. Studying this material may unveil the mechanism of high-temperature superconductivity in the Fe-based materials. We conducted magnetotransport measurements down to 1.4 K both for inter-plane (H//c) and in-plane (H//ab) field directions in static magnetic fields up to 14 T and pulsed magnetic fields up to 70 T. H//cc2. 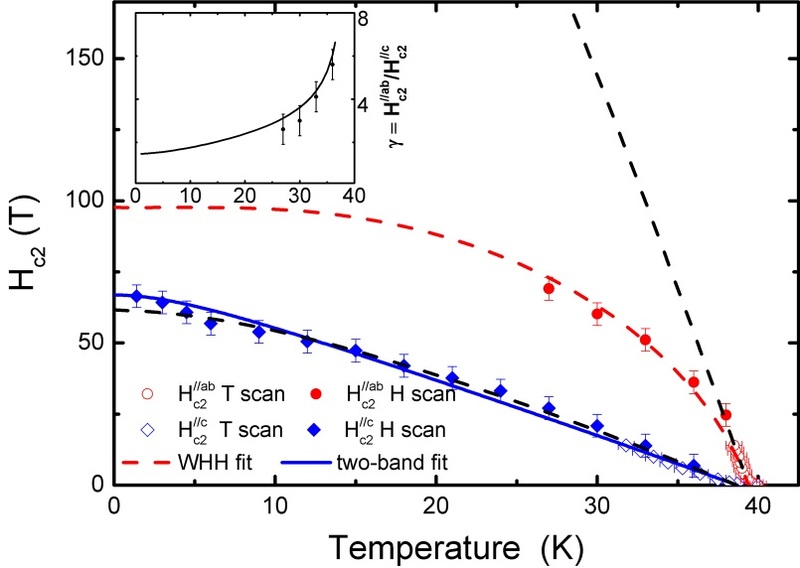 We observed a quasilinear increase with decreasing temperature below the superconducting transition which can be described well by an effective two-band model with unbalanced diffusivity. H//abc2 shows a flattening below 35 K and follows the Werthamer-Helfand-Hohenberg (WHH) model incorporating orbital pair-breaking and spin-paramagnetic effects, yielding zero-temperature critical fields of H//cc2 (0) ≈ 67 T and H<sup>//abc2 (0) ≈ 98 T. The anisotropy of the upper critical fields, gamma(T) = H<sup>//abc2/ H<sup>//cc2, monotonically decreases with decreasing temperature from about 7 near Tc to 1.5 at 0 K. This reduced anisotropy, observed in most Fe-based superconductors, is caused by the Pauli limitation of H<sup>//abc2. Our results show that the behavior of Hc2(T) and the Pauli limitation of FeSe11111 are similar to other Fe-based superconductors, suggesting that FeSe- and FeAs-based superconductors may share a common mechanism for superconductivity. The study was carried out by Z Wang and J Wosnitza, both at Hochfeld-Magnetlabor Dresden (HLD-EMFL), Helmholtz-Zentrum Dresden-Rossendorf in Germany, in collaboration with J Yuan et al. at Beijing National Laboratory for Condensed Matter Physics, Institute of Physics, Chinese Academy of Sciences in China. The work in Beijing is supported by NSFC (11574370 and 11274358). J Yuan was also supported by the Outstanding Technologist program of the Chinese Academy of Sciences.